Premium HDMI to DVI Cables with unique designed zinc alloy molding. 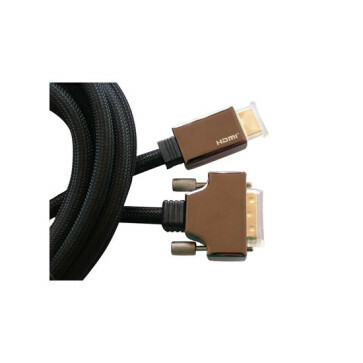 These high quality HDMI to DVI cables have a unique designed Zinc Alloy molding which can prevent signal interference effectively for its zinc alloy molding. It looks so elegant and beautiful by its unique designed zinc alloy molding. DVI (Digital Visual Interface) provides a high-speed digital connection unique for the digital display technology. This video interface technology maximizes the quality of flat- panel LCD monitors and high-end video graphics cards. DVI is becoming an industrial standard with graphics manufacturers, and most of the graphic cards are now designed for both a VGA and a DVI output. In addition to becoming the computer graphics' standard, DVI is also the digital transfer method for HDTV, EDTV, Plasma Display, and other high-end video displays (TV and DVD player). Perfect for connecting your Digital Video Interface Monitors, Projectors, and Video Cards.